One morning at the Adventist Health Rockwood Urgent Care Clinic, a man walked in screaming he was going to kill himself. After initially pulling him back from the brink, the clinic staff were able to get him into a waiting room. He was crying and upset. "We asked him, 'Do you like dogs,'" said Vicky Ascoli, a certified medical assistant at the clinic. 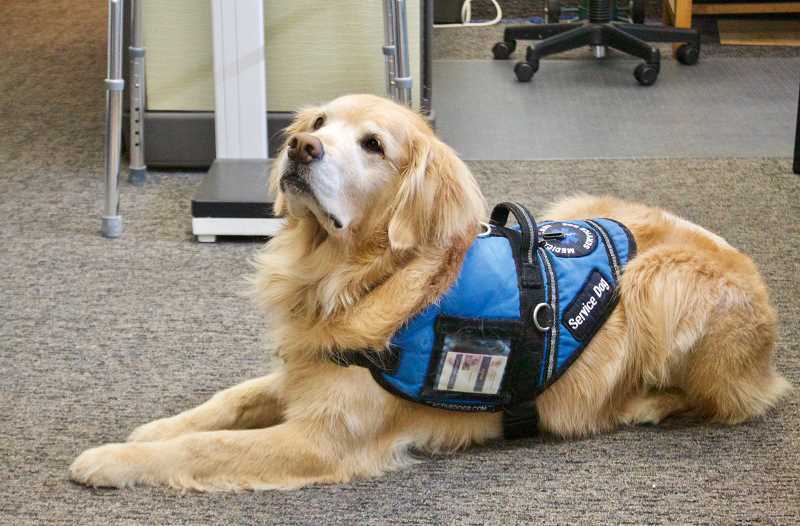 Moments later he was opening up to Akina, the service dog that works at the clinic at 18750 S.E. 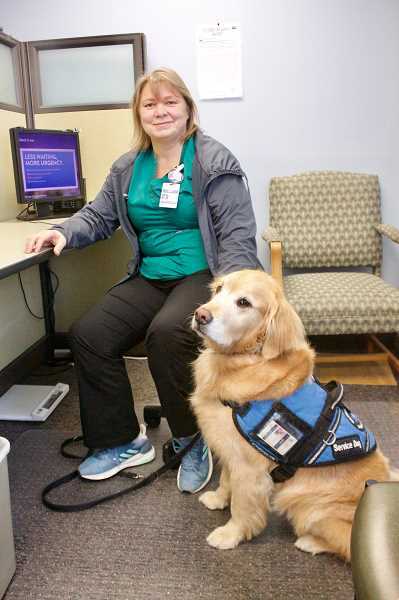 Stark St.
"When our patients need someone to talk to, or comfort them, we introduce them to Akina," Ascoli said. Akina, who is named after the Japanese word for spring flower, lives with and was trained by Ascoli. 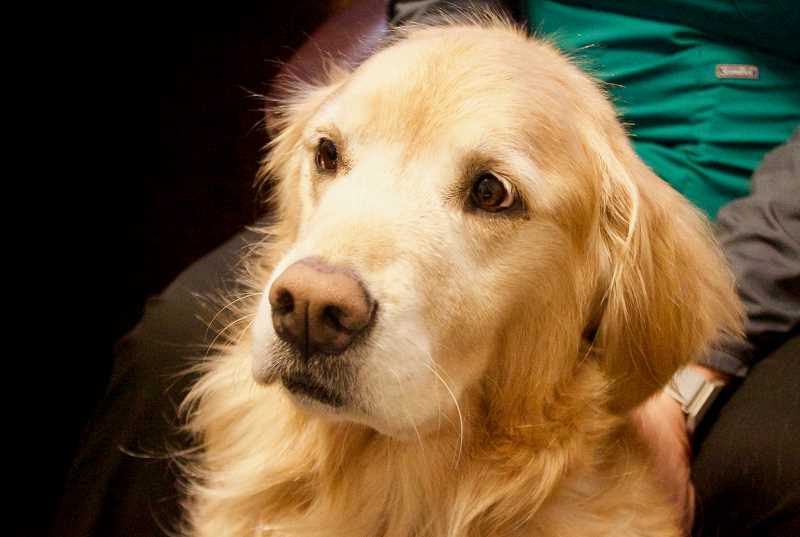 The perky golden retriever, who will turn 6 in July, has become a popular mainstay at the clinic, brightening people's days during times of turmoil and pain. She makes a big difference to all kinds of patients, from those with high blood pressure, kids with breathing problems, those who are suicidal, homeless and more. Akina is able to put smiles on people's faces. Ascoli started training dogs a few years before Akina, raising puppies to become autism service animals. Through that experience, she got to know some of the local breeders, and so when her own mother was having coronary issues, she reached out to her contacts to see if a dog was available. That is how she first met Akina. "This little puppy had so much energy," Ascoli said. Working with Ascoli's mother was perfect training for Akina, and she socialized with all sorts of people as a puppy. As a result, Akina is able to deal with the varied situations she faces at the clinic because, well, nothing surprises her. One of Akina's earliest tasks was visiting the former Portland Adventist psychiatric unit, where she would meet with the residents. One of the women in the unit would never talk to anyone and spent her whole day inside her room alone. During Akina's first couple of visits, the woman would pat her head, but still remained aloof. Gradually she got more used to her, and started taking Akina on walks and having the dog sit on her lap. By the end, the woman in the psych unit who never spoke with anyone was spending long stretches talking with Akina out in the garden. "Dogs are wonderful listeners, and Akina is one of the best," Ascoli said. One time, a little girl came into the clinic with respiratory issues. She was panicking because she was having a lot of trouble breathing, and her parents also were worrying. But because of a petting session with Akina, the girl was able to calm down and get her breathing under control. Two weeks later, the girl came back with a key chain she made for Akina. "It's a connection," Ascoli said. "People come in and love meeting Akina." 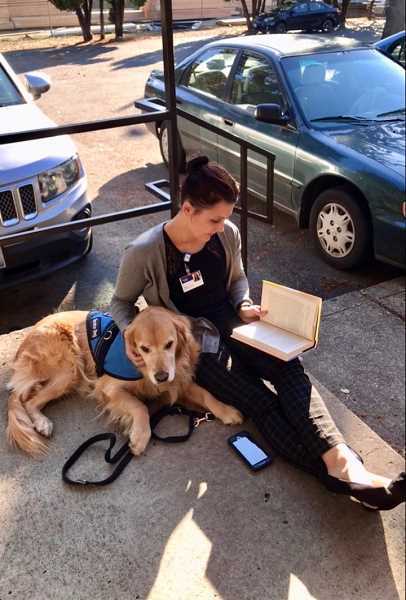 Having a service dog at an urgent care clinic is not common, and Akina has become a rock star throughout the Adventist system. Asoli jokes that no one recognizes her when she goes to different events, but when people realize she is Akina's mom, they get excited. Akina's biggest strength is connecting with kids of all ages. She is very protective of children and often serves as the clinic babysitter when parents are having lab work done. When one of the receptionists at the clinic was expecting a child, Akina wouldn't leave her side through the whole pregnancy. "I thought Akina was going to go deliver the baby," Ascoli said with a laugh. Akina has been a good distraction for the staff, who love being around her. In the mornings, before the clinic opens, they will throw the ball with her and let her run around. When the day starts, and Akina puts on her vest, she becomes all business. She spends her time at the reception desk, greeting anyone who wants to scratch a dog behind the ear. "I'll be walking at the mall with Akina and people will run up and say 'Oh, that's my Doctor's dog,'" Ascoli said. While Akina still has more years ahead at the clinic, eventually she will help train other service dogs. But for now she will continue making her rounds. "Akina being here is like having a little bit of home in the clinic," Ascoli said. "It's the humanity of it. She provides peace."